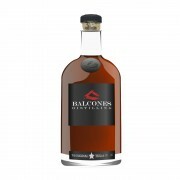 Balcones is one of the best distilleries in the world. Amazing considering they have very few spirits with more than 2 years of aging. Their offerings feature depth in both variety and complexity of flavor. Not bad for a small startup situated in the town of Waco Texas. Rumble stands out as the most unique spirit in a lineup that ranges from blue corn bourbons to oak smoked whiskey aged in custom Hungarian oak barrels. The spirit itself is distilled from all Texas ingredients: Wild flower honey, turbinado sugar, and mission figs. Despite the lack of grain, rumble keeps to a whiskey flavor profile while adding its own unique character. 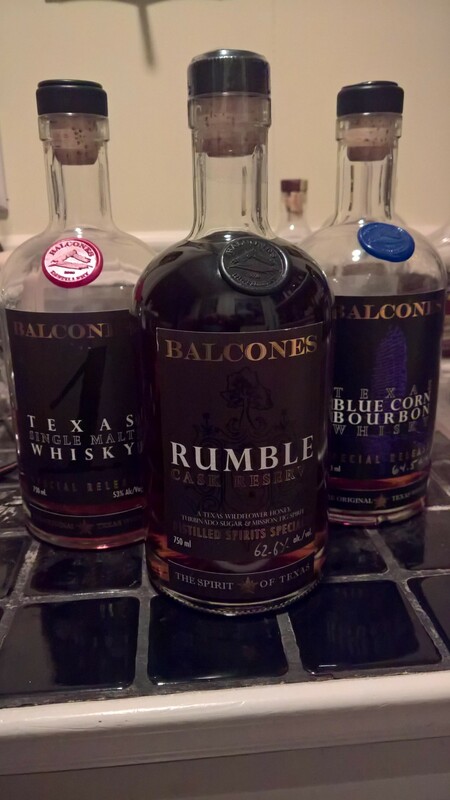 Balcones has several special releases each year. Usually they are cask strength versions of their standard lineup. This year I was fortunate enough to pick up a rumble cask reserve. I've been looking forward to trying this spirit. The reviewed sample is my very first pour. Taste: Black tea and barrel char take the lead. Warming spice kicks in, but it is deftly restrained. Where are they hiding the burn in such a young spirit? Dark fruit takes over courtesy of the mission figs which share the stage with wild strawberries. Finally the sugar and honey bring in sweet and floral notes. The spirit is remarkably well layered with each segment waiting its turn. Finish: The heat comes in just the right way here. Warmth, but no burn. All the flavors join back together in a raucous stampede. Balance: Lovely in all aspects. I feel like the only thing missing is a little extra rummy sweetness and fruitiness that presents in the normal version. Adding a dash of water or a few chips of ice fixes this and ups the palate, but also increases the spice that has been subtly hiding. 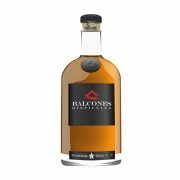 Final Thoughts: This is another excellent expression from Balcones. I've been looking forward to trying this unique cask strength spirit for several years now and it does not disappoint. The closest bottle to this in my cabinet is my hand selected barrel of 9yr Dickel. I think that Dickel is excellent and Rumble adds some fruit to enhance the overall experience.